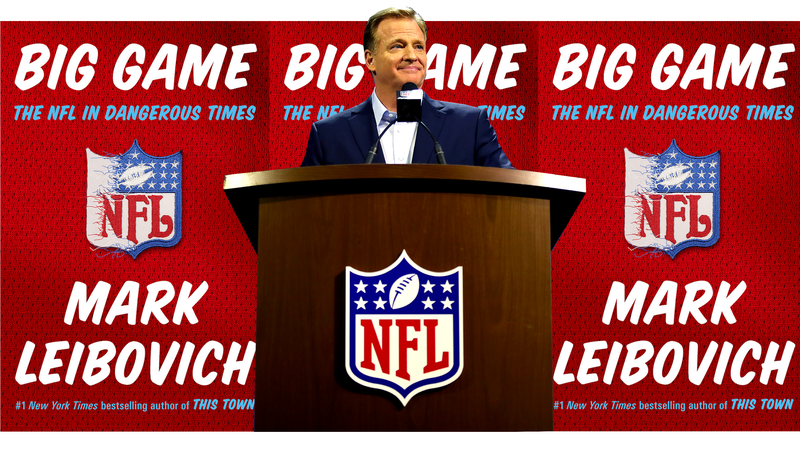 Excerpted from Big Game: The NFL In Dangerous Times, out today from Penguin Press. Here I was hanging with Rog on a football field, about an hour before the start of the NFC Championship Game: Arizona Cardinals and Carolina Panthers, Bank of America Stadium in Charlotte, January 24, 2016. We convened on the sideline as Goodell performed his ceremonial pre-game rounds with the coaches and referees and countless auxiliaries. On the surface, this should have been an exciting experience for me as an NFL junkie. I had never been on an NFL field before, much less on the occasion of such a Big Game. What better place and time to interview a Commissioner of Football than on the turf during Championship Sunday, the second-biggest national holiday on the NFL calendar? I try to remind myself of all the cool things I would never have gotten to do if, God help me, I had gone to law school. But as a practical matter, this was a lousy environment to conduct an actual interview in. The stadium was pulsing with noise and the pre-game sideline was rife with distraction—probably just how the NFL envisioned this. The interruption fodder would limit Goodell’s exposure, curtail him from venturing into areas of hazardous depth, and minimize any chance of rapport between us, such as it was. Beyond that, two to three feet of snow had fallen on much of the Northeast over the previous thirty-six hours, grounding most commercial flights. This forced me to drive eight hours from Washington, D.C., to Charlotte, the first leg through whiteout conditions. I barely made it to the stadium on time. Goodell, on the other hand, had his own plane and enjoyed a much more leisurely Sunday (which is not to suggest he relaxed for a second—or didn’t work out like the total animal that he clearly is). Goodell volunteered that he had shoveled out the driveway of his home in Bronxville that morning, enabling him and the First Lady of the Shield to get in a SoulCycle class before he had to leave for the game. (What, you think these glorious abs happen by accident?) That morning’s New York Post had greeted snowbound New Yorkers with a simple message that put Goodell in a bright mood. Stay home and watch football was the front-page command. “I said, ‘That’s my headline!’” Goodell told me, about as close as he ever comes to boyish excitement. Greg Aiello [the league’s longtime flack] had summoned me to where he and the commissioner were standing at about the 40-yard line. Goodell got things rolling by telling me how much he loves his job. “I wake up”—around 5:30, works out, does his weights and cardio—“get jazzed up and then I’m ready to go.” Goodell said his mind races during his workouts with all the things he’s going to do that day. His schedule could change at a second’s notice, which he appreciates. “I could go from talking to a senator, mayor, governor to some media CEO to meeting a bunch of Hall of Fame coaches and players and talking about the catch-versus-no-catch rule,” he said. It could be one thing after another, or there could be a detour into something else. “You sometimes have to shift, and I love that,” he said. The commissioner keeps shifting, as people keep interrupting us. The general manager of the Panthers, the president of the Cardinals, someone named Isabella, some friend of the chief financial officer, a guy Goodell recognizes and who wanted a picture with him. One revelation to me was the sheer number of civilians who are allowed to be on an NFL field before a game. Hundreds, maybe thousands, of nonessential personnel are just hanging around—you’d think it would be more restrictive. I tried to get in a few questions, including one—betraying my parochial interest—about whether Goodell had any regrets over how the league had handled Deflategate. “Fans want to know that we’re going to make sure that the rules are enforced across all thirty-two teams,” Goodell lectured me. He is, after all, the last line of integrity against all enemies of the Shield, foreign and domestic. “Thank you for looking after the game,” people tell him. “I hear that a lot,” Goodell said. “I hear that all around the country, all the time.” This explains why Goodell is so beloved in fan surveys. Goodell toggles between the language of closed-off jock and the advanced glad-handing touches of a politician’s son. He kept saying my name to punctuate his sentences—Mark this and Mark that. Like [Tod] Leiweke and other executives at the league, Goodell will often default into management jargon. He tells me he is a big believer in “what I call the third solution.” He explained to me what this meant. “You have one solution,” Goodell said. “And you have another solution. But it’s usually not either one, it’s the third solution.” (I totally get it!) That’s what Goodell meant by “third solution.” “If you work the process, you begin the process of working and listening, you get to a better place,” he said. “Come on, let’s walk,” Goodell told me. We were trying to get to a better place. “If we don’t get away from the crowd, we’ll never get this done.” I asked Goodell to tell me about the “man cave” in Bronxville, from where he watches a lot of games. He apparently likes to talk about his man cave as it bolsters his “just-another-slob-on-the-couch” bona fides. His sanctorum, Goodell told me, is equipped with three TVs, which he watches simultaneously while checking multiple laptops. He watches as a fan, as a commissioner, and as a micromanager. He pesters his staff and fires off emails. I asked Goodell if he had seen Concussion. The NFL’s PR advisers, I later learned, had prepared him for this question, part of their larger “Ignore Concussion” strategy. If asked, Goodell was counseled to say that no, he had not seen the movie. He is so busy, he rarely has time to see movies; and when he does, his wife usually picks them out. Accordingly, Goodell told me that, in fact, he had not seen the movie. “I can’t tell you the last time I’ve been to a movie,” Goodell added. And then in the next breath he mentioned he had seen The Intern, starring Robert De Niro, just the night before, with his wife and teen daughters. Broken football players were not a fun area for the commissioner—“player health and safety” would be the approved league term. Goodell had his standard “health and safety” ammunition ready (all the new rule changes, the first-class doctors and trainers in attendance for this game). But there was no shortage of “yes but on the other hand” for me to come back at him with. A few days earlier, former Steelers and Redskins wide receiver Antwaan Randle El had turned himself into that week’s installment of what had become the NFL’s own parallel reality show—a much darker one. Randle El was the latest ex-player to share his harrowing tale of postcareer physical and cognitive hardship. “I would play baseball,” Randle El said in an interview with the Pittsburgh Post-Gazette. At only thirty-six, Randle El said he has bouts of memory loss and struggles to walk downstairs. When I asked Goodell about stories like this, he played the “we’re generating awareness” card. “It is part of the conversation,” he told me. Players and former players, he said, now feel freer to “come forward” to discuss their medical and mental issues. In fact, we should view the Antwaan Randle Els as signifiers of progress. I mentioned to Goodell another recent example of our culture’s enhanced “awareness”: Pittsburgh and Cincinnati had met in a deranged spectacle two weeks earlier under the guise of a wild card playoff matchup. People had been talking about the game for days—another “national conversation” commenced, courtesy of our facilitators at the NFL. The contest featured a belligerent chaos of fights, cheap shots, rowdy fan behavior, ejections, and concussions. It was one of those would-the-center-hold cliff-hangers where you found yourself watching—past midnight—not just to see who won the game but also to see whether the end of civilization would be televised, live from Cincinnati. CBS announcer Phil Simms labeled the scene “disgraceful,” echoing the opinion of many viewers, including at the league offices. “I don’t think that’s what our fans want to see,” Goodell told me when I asked about the debacle. “The fact that those hits stood out to so many people shows us how our culture has changed.” Again, that game might have stuck out as a black eye for the NFL, but it was also proof of progress. Praise to the Shield, again. “Those hits were relatively common when I became commissioner,” Goodell pointed out, for anyone keeping score. When Goodell turned back to me, he looked miffed. Why, he wanted to know, was I not following the AFC Championship Game on some app called “NFL Mobile”? At minimum, these divergent responses to the Pittsburgh–Cincinnati game indicated that “awareness” cut in all directions. It also gave me an appreciation of how Goodell gets it from all sides, and how the Shield itself represents its own Rorschach test in the larger cultural skirmish. Goodell and I had walked and talked about twenty yards down the field. I was grateful to have rated a Preferred Level customer on the commissioner’s schedule during these crowded pregame moments. But it did not last long. Goodell had business to conduct. Arizona coach Bruce Arians had moved into schmoozing vicinity. Goodell walked over, wished him luck, and went in for the hug. There was an assistant coach and a referee to greet, someone’s niece over there, panoramic respects to be paid. While Goodell was otherwise occupied, I watched the closing minutes of the Patriots and Broncos in the AFC Championship Game up on the Bank of America scoreboard. Things looked bleak for the Pats, who were down 20–12 and had just given the ball back to Denver with a little over two minutes left. As game time in Carolina approached, the scoreboard stopped playing the other game, leaving me to try to follow NE–DEN on my phone by way of ESPN.com. When Goodell turned back to me, he looked miffed. Why, he wanted to know, was I not following the AFC Championship Game on some app called “NFL Mobile”? I admitted I had no idea what “NFL Mobile” was. (Bad answer: apparently hell hath no fury like the commissioner confronting a barbarian not availed of some NFL consumer product gizmo.) Goodell held up his phone and tried to demonstrate for me the ease and pleasures of following a game via NFL Mobile. But his app was slow to load, as sometimes happens when you’re in the middle of 75,000 people. “Watch, now it’s going to screw up,” Goodell said, frustrated. Panthers coach Ron Rivera walked over for a quick hug- hello. Goodell turned back to me again and his NFL Mobile was still not loading. He was becoming more and more agitated, which I admit I was a little pleased by given his earlier high horse. “This pisses me off,” he said. As the scoreboard clock ticked down to kickoff, the Bank of America Stadium kept getting louder. The amped-up roar of a Panther kept crackling through the place. You hear these Sensurround growls at the stadiums of teams whose mascots are predatory felines, like the Panthers, or the Nittany Lions of Penn State (whatever a Nittany Lion is, it sounds a lot like a panther in State College, Pennsylvania). Noise kept building inside the coliseum until it suddenly became quiet. “Where’s the flag? I can’t find the flag,’” Goodell said, scanning the field while preparing to observe “The Star-Spangled Banner.” But instead of the anthem, this would be the prayer that would precede it. And the commissioner closed his eyes and lowered his head and struck a stern pose, the look of integrity. Mark Leibovich is the New York Times Magazine’s chief national correspondent, based in Washington, D.C. This excerpt is from his new book, Big Game: The NFL In Dangerous Times, which is out today. It is reprinted with the permission of Penguin Press. Buy it here.